Mort Kunstler Hand Signed and Numbered Limted Edition Print:"Blessing of the Sword"
Edition::Artist Signed and Numbered Limited Editions w/ COA. Limited to 950 Prints and 95 Artist Proofs. 100 Canvas Editions and 10 AP's.. Size: Image Size: 14" x 23" � Overall Size: 19-1/2" x 28" / Canvas: 17" x 28". About the Print: It was a scene repeated throughout the South - especially in the opening days of the War Between the States. Like their Northern countrymen, most Southerners wanted no war, but the war came - and responsible men were committed to do their duty. From Charleston to Galveston, from Richmond to Little Rock, from Memphis to Mobile - Southern men in uniform left for war. The leave-taking could be as brief and simple as a fleeting embrace and a promise to remember and return. Among the leaders of the land, however, departure was often marked by solemn ceremony. Family and faithful friends gathered in support of the man who was bound for war. Endearments were shared, memories were recalled, toasts were offered and pleas for protection were prayed. Often such ceremonies were capped by the presentation of an ornately engraved edged weapon. It was offered with a heartfelt blessing - a leave-taking benediction of hope that the sword would remain sheathed or that it would provide protection from the brutality of battle. It was typically received with gratitude - and a vow to carry it with honor, to faithfully do one's duty, to return when the homeland no longer needed defending - and even in the darkest hour to remember those left behind. Then the time of departure was at hand, the man in gray was gone - and the blessing of the sword remained only as a memory. Mort K�nstler's Comments The idea for this work was suggested to me several years ago, but I did not decide to paint it until I discovered this 19th century poem by T.B. Read. The Brave at Home The wife who girds her husband's sword �Mid little ones who weep or wonder, And bravely speaks the cheering word, Even though her heart be rent asunder, Doomed nightly in her dreams to hear The bolts of death around him rattle, Has shed as sacred blood as e'er Was poured upon the field of battle. As I researched this painting, I learned that there were innumerable presentation swords and sabers carried by Northern and Southern officers and non-coms during the Civil War. It was usually a handsomely-crafted, non-regulation weapon given as a token of esteem by family, friends, or admirers. Sometimes, when the gift was very expensive - and the officer was very popular - funds for its purchase were raised by subscription in the community. A presentation ceremony was often formal and elaborate, but sometimes it was an intimate family affair set in a drawing room with relatives and close friends. I chose the latter for the setting of this picture. It gave me an opportunity to paint a moving scene that was common during the war, and the setting allowed me to portray an interior scene with dramatic lighting. It also allowed me to portray period dress and furnishings typical of America's leading families during the era. 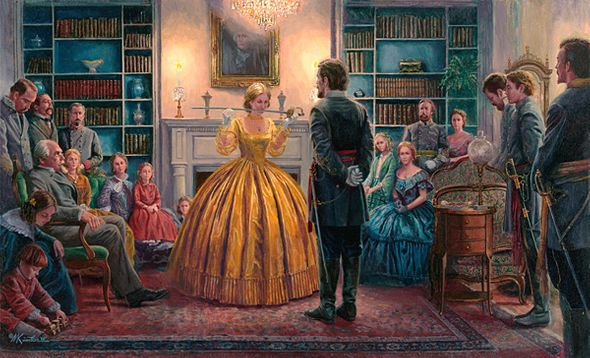 I can only imagine what words were said by a wife or sweetheart like this Southern woman before lifting the blade to her lips - and what emotions touched the hearts of the loved ones who were present. To me, these tender farewell moments reflected our people's devotion to both family and duty - and were so American.